August 8, 1959 –More than 100,000 people line Michigan Avenue as 50 floats and marching units usher the Pan-American games into the city. The parade, proclaimed the Chicago Daily Tribune, “had everything … ‘the aye-yi-yi’ of Mexican singers, accompanied by mellow guitars. There was a Mayan temple and an ancient warrior from Guatemala. There was a platoon of youngsters in full bull fight regalia.” [Chicago Daily Tribune, August 8, 1959]There was even a reluctant donkey, part of the Jamaican entry, that refused to budge at Congress Parkway and Michigan Avenue, causing his minder to tie him to a light pole and walk away. The police were having none of that and ordered the four-legged parade entrant to keep it moving. 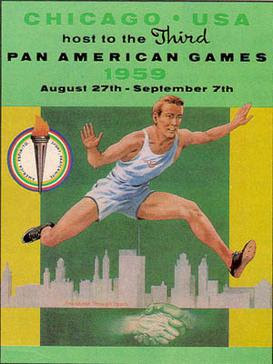 The Pan Am Games ran from August 27 to September 7. It would be the first time in the history of the event that the United States sent an Olympic-caliber team. The games were a demonstration of the city’s ability to pull off a major event on short notice … Chicago had just 18 months to prepare for the Pan Am Games after the original host city, Cleveland, pulled out of its commitment, citing financial problems. There were some glitches to be expected after throwing an international event such as this together on such short notice. Peru’s rifle team had its rifles confiscated when it arrived at the airport. The 17 members of the women’s basketball team from Chile were crammed into to two hotel rooms. The soccer team from Brazil was sent to a swimming pool to practice while the Brazil swimming team was delivered to a soccer field. A Brazilian rower ended up dead, shot through the heart on the campus of North Central College. And prior to the steeplechase event at the track and field competition some prankster stocked the water obstacles with live fish, delaying the event for an hour while the fish were pulled. But it came off. The City that Works made it all work. 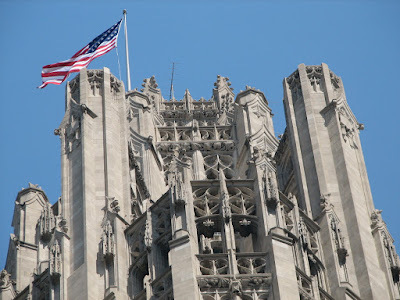 August 8, 1932: After a dedication address by United States Senator from Illinois Otis F. Glenn, a 20-foot by 30-foot flag of the United States is raised for the first time to the top of the new 90-foot flagpole atop Tribune Tower in a dedication held on the thirty-fifth floor of the building. In his dedication speech Senator Glenn says, “History has been made where this flag shall henceforth fly. 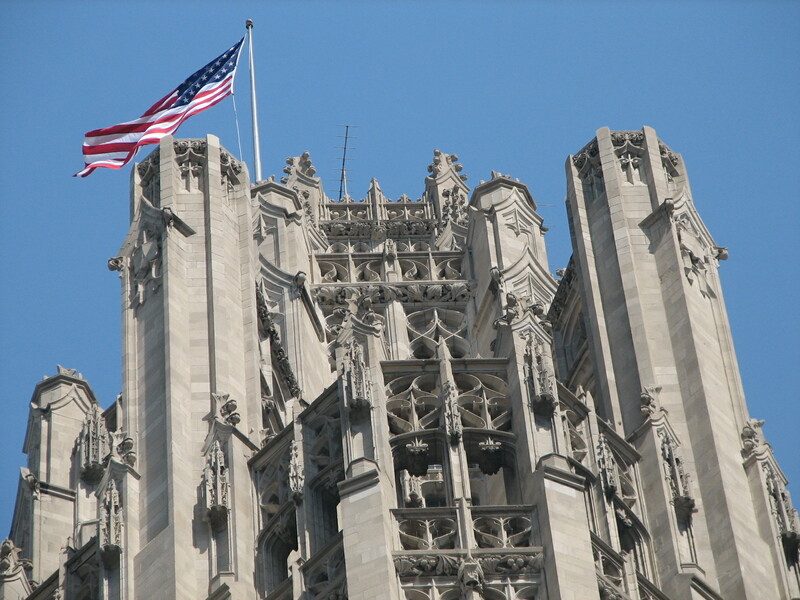 The first founders of Chicago settled on the land where the Tribune Tower now stands. Fort Dearborn was here – almost within a stone’s throw Abraham Lincoln was nominated for the presidency. Here from a great swamp has grown a great, strenuous, vital city, teeming with four million vigorous, progressive Americans.” [Chicago Daily Tribune, August 9, 1932] The proceedings are broadcast over W.G.N. radio and from ten loudspeakers around Tribune Tower to the street below.